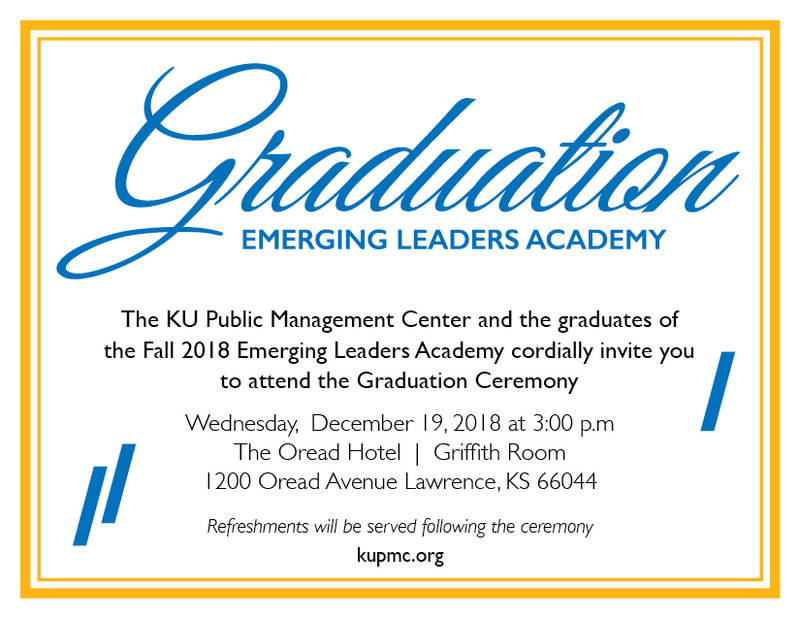 Wednesday, December 19, 2018 at 3:00 p.m.
Graduation will be held at 3:00 p.m. - 4:30 p.m. on Wednesday, December 19, 2018 in the Griffith Ballroom at The Oread. The address is 1200 Oread Avenue, Lawrence, KS. The Oread is limited to 200 parking spaces and cannot guarantee that everyone will receive a space in the valet parking garage. Should the garage become full, there is additional parking at The Union Parking Garage—also called the Mississippi St. Garage—a half a block south of The Oread, next to the KU Union. There is a new ParkMobile App that it used to park here. Please visit the KU Visitor Parking webpage for more details. Important Note: DO NOT park in the lots adjacent to The Oread (apartment complexes) as you will be towed. Class: The ELA class will meet as usual starting at 8:30 a.m. at The Oread in Gathering Room 1. After lunch we’ll reconvene until about 2:15 p.m. and then break for a group photo. Class photo: 2:15 p.m. Graduates, please be in the Griffith Ballroom for this photo. Griffith Ballroom: Graduates will be seated in alphabetical order. The flow for certificate reception will be explained. Reception: light desserts will be served in the ballroom after the ceremony. We will have a photographer during the event, so please be courteous of their time and space. Family and friends are welcome to take photos as well, after the photographer has taken a photo of each graduate. Please contact us if you’d like to share your photos through our Facebook page. Graduates typically dress up a bit. Business casual is an appropriate style. Those who have uniforms – law enforcement, fire fighters, etc. – often wear them. We estimate that there will be around 150, including the 50 ELA graduates, their guests, the PMC staff, and other guests. You are encouraged to invite anyone with whom you would like to share this celebration and/or who you want to know about your participation in the program. This can include friends, family, children, coworkers and those in your organization – especially supervisors – who supported your participation in ELA. The Oread Hotel and Griffith Ballroom are wheelchair and mobility accessible. If you need other accommodations, please contact Kristina Gallaher at kristinagal@ku.edu a couple of days prior to graduation.